The Research in Imagery and Observation (RIO) Group was formed in 2006 and aims to provide a forum to meet and discuss research in imagery and observation. The purposes of the meetings are to give members a chance to present their research findings and ideas and to facilitate group discussions. The RIO group organizes one meeting a year at different locations across Europe. There is a useful range of expertise within the group and the research carried out by the members varies from applied sport science to cognitive-neuroscience (including for example research within exercise and rehabilitation). Find out more about group and the annual meetings here. 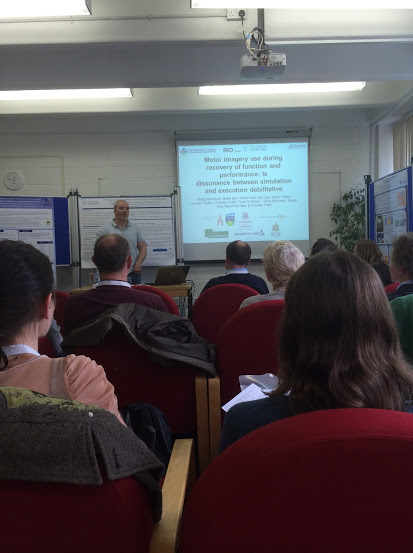 Mary Quinton and Fredrik Weibull from our BRIO group attended the 9th Research in Imagery and Observation (RIO) meeting at the University of Stirling, Scotland on the 14th-15th May 2015. The first day started with an invited lecture from Professor Ferdinand Binkofski who talked about the implementation of action observation in neurorehabilitation. Any students would be happy to know that this research area suggests naps are beneficial to consolidate learning to remember things better, a tip for upcoming exam revision perhaps? The theme of rehabilitation then continued into the first symposium – “Imagery and Observation in Clinical Science”. These presentations included research from the Body Eyes and Movement (BEAM) lab at Manchester University who have been investigating different gesture viewpoints during action description and the effects of visual cues on hand movements in Parkinson’s disease. Ling Choo and colleagues based at the University of Glasgow then presented results from their systematic review on the neural correlates of bilateral upper limb training after stroke. Surprisingly there have been no imagery interventions in this area of research – an invitation for someone reading this blog? Tadhg MacIntyre’s research group then talked about motor imagery use for injured athletes during recovery and the topic of cognitive dissonance between simulation and execution – a really interesting topic which I’m sure we’ll be hearing more about in the near future. 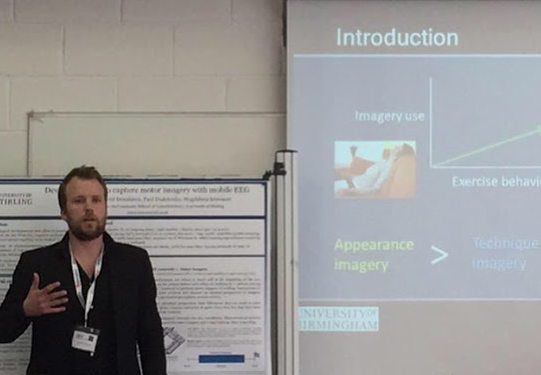 In symposium two (“Imagery and Observation in Sport and Exercise Science”), MacIntyre’s research group spoke about their upcoming research investigating depression through motor simulation and motor imagery performance and injured athletes’ imagery use in recovery using a mixed methods approach. Does this sound interesting to you? Want to hear more? Look out for our interview from the conference with Tadhg MacIntyre (coming soon on the BRIO group blog). Adam Bruton (University of Roehampton) then presented some of his PhD work on the effect of observation interventions on collective efficacy in elite youth rugby union players. Even though the rugby team didn’t have the best season overall, watching video highlights of their matches at the start of each week helped improve their collective efficacy – it truly is the taking part that counts? Last but by no means least, BRIO members Mary Quinton and Fredrik Weibull presented their PhD research. Mary discussed how who you are can influence your perception of your imagery experience, as her research shows that skill level influences how an individual interprets their imagery (i.e., as facilitative or debilitative). Whereas Fredrik discussed how exercise imagery mediates the relationship between exercise behaviour and affective outcomes, showing that enjoyment imagery can partially explain why people enjoy their exercise experience and experience positive outcomes from their exercise behaviour, like revitalization. In the end of the first day we experienced a fantastic whisky tasting at the venue which included a lot of laughs. This was followed by a lovely dinner. Stéphane Grade (University of Louvain) was the first presenter during the symposium of day 2 (“Imagery and Observation in Action Cognition”). He gave an informative talk about exploring action simulation embodied cognition using distance estimation and reachability perception judgment. This was followed by Daniel Eaves (Lancaster University) who presented research by himself and colleagues on “The effects of physical practice on automatic imitation effects in rhythmical actions”. Bretherton presented work by himself and Watt (University of Sterling) on music, motion and emotion. We listened to a piece of music while Bretherton showed us how music affects Heart Rate (HR). Predictable parts of the music lowered HR while unpredictable parts caused an increase in HR. Bretherton also described why music could be seen as a person in motion. This was followed by interesting talks from Ellen Poliakoff (University of Manchester) on “Exploring the effects of attention and motor imagery on the kinematics of imitated hand actions” and Clément Letesson (University of Louvain) on “Action prediction from action observation and contextual cues”. Bruce and Ietswaart also presented fascinating work with parrots and how they can learn from observing different human actions. The conference ended with an invited lecture from Scott Glover who talked about his ideas of a unified model of imagery and about the factors influencing the timing of real and imagined actions. He gave an interesting talk in which among other things he criticized the use of the term functional equivalence. Instead he proposed to use the term functional overlap. He presented a model of the neural and behavior processes of motor imagery and how they relate to the processes of real action. He also presented research that supported some of the tenets of the model. It was a great conference with its usual mix of researchers from cognitive, clinical and sport science backgrounds. The presentations and meetings stimulated great discussions on both theoretical and practical issues. We want to thank the organizers for a great experience. Next year we the RIO group will celebrate its 10th anniversary. Check the RIO group website for updates.